Panoramic picture of the Peggy's Point Lighthouse, Nova Scotia, Canada. The rock with the lighthouse at Peggy's Point. The lighthouse at Peggy's Point is one of the most photographed buildings in Canada. It marks the eastern shore of St. Margarets Bay approximately 40 km southwest of Halifax. The current tower was built in 1915. The tower is a tourist attraction during the whole summer. Even on a foggy day, many visitors come to see the lighthouse. The panorama was taken in summer 2012. The view goes northwest along the coast in the direction of the SR 111 memorial site. The building right of the center is the Sou'Westes Gift & Restaurant. 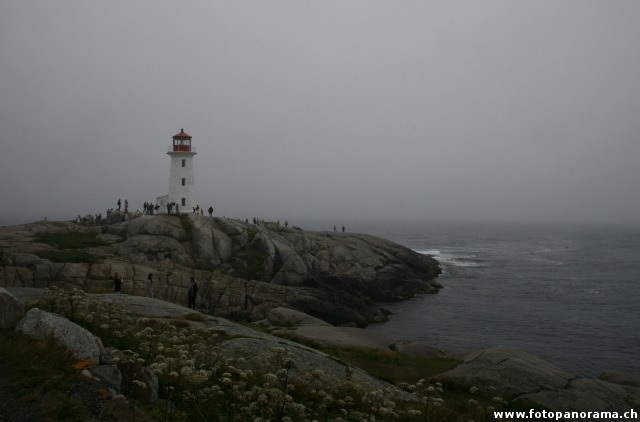 Nova Scotia Lifeguard Service: Peggy's Cove lighthouse: Information about the Lighthouse. Nova Scotia.com: Nova Scotia Tourist Info. Sou'Wester: Gift Shop & Restaurant in Peggy's Cove.